Serious workplace violence is on average four times more common in health care than in other private industries. The man's complaint seemed straightforward: He had come to the emergency room last June at Harrington Hospital in Southbridge, Massachusetts, for wrist pain that wouldn't quit. The 24-year-old patient seemed anxious. But he didn't present any signs of being dangerous — red flags that nurse Elise Wilson had come to recognize over the course of her four-decade career. She had spent 35 years in the ER, where nurses encounter violence from patients or patients' relatives "almost on a daily basis," she said. Wilson started entering the patient's vital information into a computer in a triage room. When she turned around, he was looming over her with a knife. "The first thing he did was punch me in the head," Wilson, 66, said. From there, a normal day at work turned into a fight for survival as Wilson got stabbed in her neck, then nearly a dozen times in her arm. With the other arm, Wilson grabbed her nurses' clogs and banged them on the floor to catch other hospital employees' attention and screamed. But her resolve to protect other health care workers is stronger than ever — especially after the killing last week of three staff members at a Yountville, California, treatment facility by a troubled veteran. 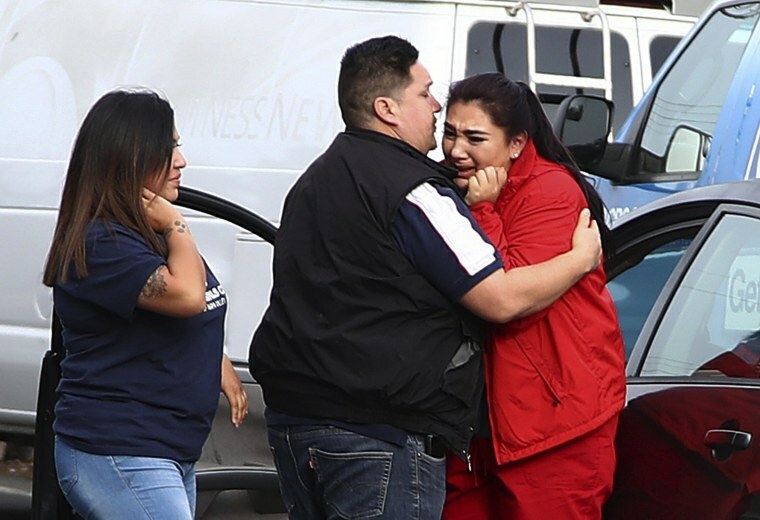 Health care workers face an alarmingly high rate of serious workplace violence, which is on average four times more common in health care than in other private industries, according to the Occupational Safety and Health Administration. The World Health Organization estimates that up to 38 percent of health workers throughout the globe suffer physical violence at some point in their careers. And the American Nurses Association, which represents 3 million nurses in the U.S., reports that 1 in 4 nurses has been assaulted at work. There have been high-profile incidents in recent years: the Utah nurse whose rough arrest after she refused to draw an unconscious patient's blood was caught on video; a Boston surgeon who was fatally shot by a patient's son. But health care workers say they deal with other violence on a regular basis, like being kicked, pushed, hit, spit on, and verbally abused. "We work with people with histories of violence who may be delirious, have dementia, be under the influence of drugs, and we also work very close to them, almost intimately, and often we're alone when we're working with our patients," said Seun Ross, the director of nursing practice and work environment at the American Nurses Association. "I think that all of those aid in the profession's propensity to being exposed by violence." Yet despite the frequency with which the incidents happen, there are no federal regulations that protect health care professionals from workplace violence — only some scattered state laws. While OSHA has offered voluntary guidelines for keeping health care workers safe for more than two decades, they don't require that hospitals or other health care centers implement them. Advocates hope to change that. Last week, just two days before 36-year-old veteran Albert Wong slipped into the Pathway Home in Yountville and held three staffers hostage before killing them and then himself, a congressman from California introduced a bill called the Health Care Workplace Violence Prevention Act. It calls for OSHA to require health care employers to adopt a comprehensive workplace violence prevention plan. "Every hospital needs to have a plan to deal with workplace violence and reduce it," said Rep. Ro Khanna, D-Calif., who introduced the bill. "You may want to make sure that the tables and lamps are locked down so that people can't throw objects at health care workers, you may want to make sure that there's a safe exit, enough security, that people aren't bringing weapons of any kind into a medical facility. What the bill does is require that hospitals comply with an OSHA standard." Those in the medical profession say that not only are such precautions necessary, but better responses from supervisors and managers in response to violence are needed, too. One woman, a 26-year-old nurse from Tennessee who asked to remain anonymous out of fear of job repercussions, recalled a time last year while working in the ER when a patient, frustrated that he wasn't allowed to get out of his bed, bit her so hard on her arm that it left a large bruise. She told management, but nothing happened. "They ask if we want to report it, and then we fill out an occurrence report sheet, and then after that, that's really it. I never get a follow-up," she said, adding that in other venues, that type of aggression would be unacceptable. "I can't go to Target and bite somebody over their prices." Still, many in health care are quick to dismiss violence as part of their jobs. Dr. Kayla Behbahani, a chief resident in psychiatry at the University of Massachusetts Medical Center in Worcester, hopes to change that. Behbahani has been shoved by a patient. And when she was in her third year of residency, a mentally ill patient in an outpatient clinic became agitated when Behbahani wanted to admit her to the hospital. "She told me that the last person who admitted her to the hospital received 57 stitches, and at that point she reached for her cane," Behbahani said. Behbahani was shaken up, but wasn't hurt by the encounter. She's now on a workplace violence prevention committee at her hospital and urges residents to report any threatening behavior. "It turns out a lot of health care providers don't report verbal aggression. They only report physical. We're trying to change that behavior," she said. It's not just mentally ill patients who lash out: According to a 2014 study in the Journal of Emergency Nursing, patients with dementia or Alzheimer's and patients on drugs were the most likely to hurt nurses. Khanna, the California representative, hopes that his bill will get bipartisan support so there can be a federal standard on de-escalating and preventing violence. "I don't care who passes the law, so long as something passes." In Massachusetts, there's pending legislation called "Elise's Law," named after Wilson, the ER nurse who was stabbed. It would require all health care providers to do an assessment of the risk for workplace violence and then require them to develop a plan to prevent it, which could mean increasing security staff or putting metal detectors in parts of the hospital. "I don't care who passes the law, so long as something passes," Wilson said. "They need to make it a standard that all states have to follow." "It's just so risky out there now," she added. "It's not like we're police officers with bulletproof vests."